Gaius Marius, or as he is usually known as just Marius, is at first glance a study in opposites. He was a 'New Man' (Novus Homo), this meant he had no ancestors that Romans would know. He had only a very slim chance to rise in the 'Honors Race' (Cursus Honorum). He became Consul an unprecedented seven times. He was also touted as the 'Savior of Rome'. As a general, he was one of the best of his age. As a politician, he was one of the worst. True, the Roman Republic was in a downward spiral, but Marius did more than his fair share to destroy the Republic. He was a demagogue who was friendly with, and was allied to, some of the worst Roman politicians of the time. Marius was obsessed with power and the glory that military success could bring him. He was prepared to, and did frequently, trod on any and every Roman law or long established precedents to get what he wanted. The author shows Marius the man, warts and all. He has given us an excellent biography of Marius. This could not have been an easy task. Marius' life is as faceted as a diamond in the sunlight. He was also quite possibly the savior of Rome. Destroyer of the Roman Republic, no, but he showed the next generations where to plunge the knife. The author does contend that Marius' enemies wrote the history of the period, so that he may not have stooped so low as we have read before. It is also quite possible that Marius' legacy was saved by his execrable nephew. He may also have been just as bad as he has been painted. Savior, murderer, and trampler of all laws, Marius' life certainly deserves this biography by Mr. Hyden. The book also paints Sulla, Marius' inveterate enemy, in a very bad light. We will agree to disagree on this point. The author brings forth not only the man Marius, but the age in which he lived. He also gives us a very good breakdown of Roman politics, and a civics course in ancient Rome. 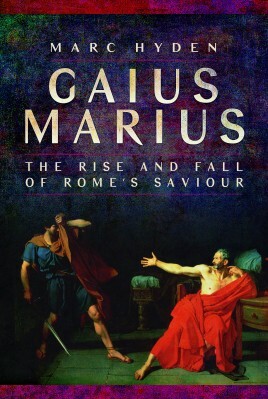 The book cover shows an almost unbelievable, but historic, event in the life of Marius. Marius is to the right. He is around seventy years old, and unarmed. His assassin is overawed by Marius' voice and personality, and cannot commit the deed. The book itself is 300 plus pages long. It is touted as being the first comprehensive biography of Marius in 150 years. I am looking forward to the author's next endeavor.